4", Had Batt'n Drill in afternoon. 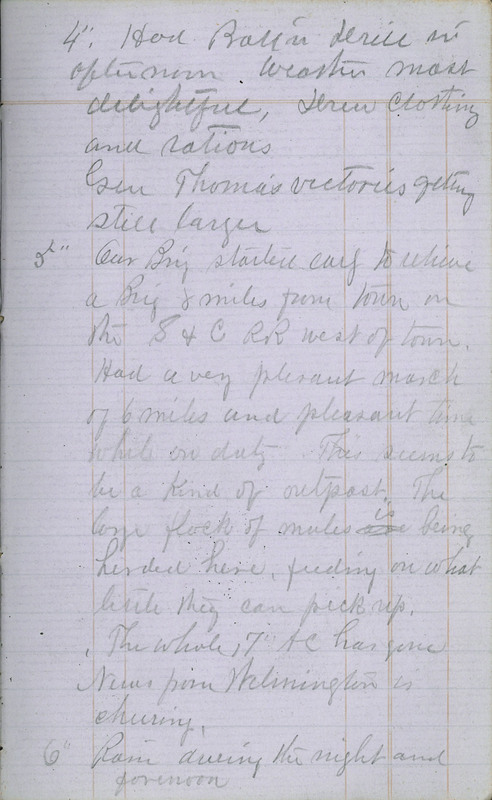 Weather most delightful, Drew clothing and rations Gen Thomas' victories getting still larger 5" Our Brig started early to relieve a Brig 8 miles from town on the S & C RR west of town, Had a very plesant march of 6 miles and pleasant time while on duty This seems to be a kind of outpost. The large flock of mules is being herded here, feeding on what little they can pick up. The whole 17" AC has gone. News from Wilmington is cheering, 6" Rain during the night and forenoon.